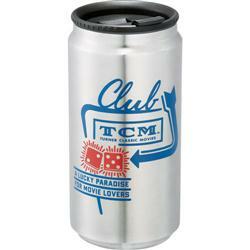 The Fizz Custom Travel Mug in the shape of a soda can - a great promotional travel mug. 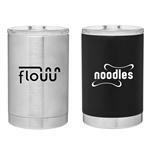 12 oz double-wall vacuum insulated stainless steel can tumbler. Plastic spill proof screw on lid with flip top function. Useful for both cold and hot liquids. A great unique promtoional travel mug with your logo. Full color imprint also available - please inquire. 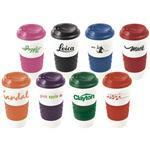 A RUSH PROMOTIONAL TRAVEL MUG - FREE RUSH PRODUCTION AVAILABLE! Typical Imprint Area(s): Centered on bottle Center of art 2.80" down from lip L 3.5" x H 3.5"
Centered on opposite side Center of art 2.80" down from lip L 3.5" x H 3.5"
Full Wrap Center of art 2.80" down from lip L 7.8" x H 3.5"
Available Imprint Options: Color Print. Full Color Imprint Available - please inquire. 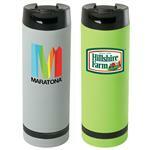 12 oz stainless steel travel mug or tumbler with imprint.